For example, the survey finds that white, black and Hispanic homeowners say in roughly equal proportions that the value of their home has declined since the start of the recession(although Hispanics are more likely to report being underwater on their mortgage). Similarly, younger, middle-aged and older homeowners are equally likely to say their home has lost value. Homeowners with at least some college education are more likely than those who never attended college to say their home has decreased in value. More than half of those with at least some college education (53%) say their home is worth less now than it was before the recession, compared with 39% of homeowners who never attended college. Similarly, higher and middle-income homeowners are more likely than those on the lower end of the income scale to say their home is now worth less than it was before the recession. For many homeowners, their experience in the housing market is a key element of their financial life. 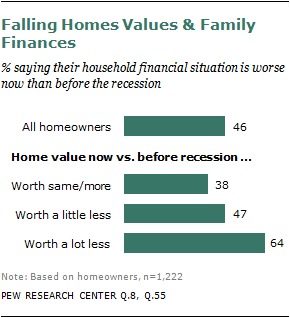 As the national economy moves tentatively into a period of recovery, those who have seen the value of their home drop substantially from pre-recession levels are among the most downbeat about their personal financial situation. Overall, the public remains skeptical about the pace of the economic recovery. Only one-in-five (21%) say the economy is recovering, and an additional 29% say the economy is not recovering yet but will soon. 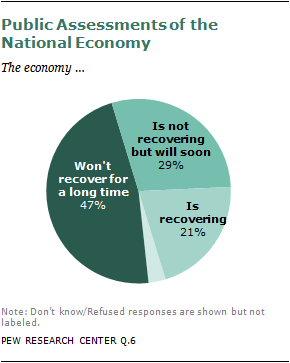 Nearly half (47%) say it will be a long time before the economy recovers. When it comes to personal finances, the pace of recovery is also slow, and here the impact of the housing crash is readily apparent. Overall, a plurality of homeowners (46%) say their household’s current financial situation is worse than it was before the recession. Some 28% say their financial situation is better, and 24% say it’s about the same. Among those who say their home is worth a lot less now than it was before the recession, nearly two-thirds (64%) say they are now in worse shape financially. This compares with only 38% of those who say their home is worth the same or more now compared with before the recession. These negative assessments of personal finances among those who took a major hit on their home value are on par with the assessments of those who are out of work. Among adults ages 64 and under who are not working and not in school, 61% say their household finances are in worse shape now than before the recession. Homeowners who were hardest hit by the burst housing bubble are also among the least optimistic about their short-term financial prospects. Among those who say their home is worth a lot less now than it was before the recession, 31% expect their household financial situation to get worse over the next year. This compares with only 21% of those who say the value of their home increased or stayed the same over the course of the recession. In addition to these pre- and post-recession assessments, overall evaluations of personal finances follow a similar pattern. Among homeowners who say the value of their home has declined a lot since the start of the recession, only 19% are very satisfied with their personal financial situation. By contrast, nearly twice as many homeowners (37%) who say their homes lost little or no value during the recession are very satisfied with their financial situation. Overall, personal financial satisfaction is up only marginally from the depths of the recession. Today, 28% of all adults say they are very satisfied with their personal financial situation, up from 23% in February 2009. The proportion saying they are dissatisfied with their personal finances is 31%—unchanged from 2009. For many homeowners hard hit by the housing crisis, their home has become a financial liability. Nearly six-in-ten (58%) of those who say their home is now worth a lot less than it was during the recession think it will take six years or longer for the value to recover to pre-recession levels. This compares with only 27% of those who say their home is worth a little less now than before the recession. 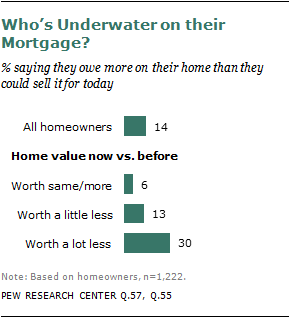 The hardest-hit homeowners are also the most likely to be underwater on their mortgage. Among those who say their home is now worth a lot less, 30% say the amount they currently owe on their mortgage exceeds their home’s market value. This compares with 14% of all homeowners. This hardest-hit group is also among the least likely to say that, if they had it to do all over, they would buy their current home again. Most (63%) of those who say their home is worth a lot less now than it was before recession say they would buy it again if given the chance. However, a sizable minority (37%) say they would not buy the same home again. These remorseful buyers are as likely to cite financial reasons for not wanting to buy the same home again as they are to point to deficiencies in the home itself. In spite of all of this, even those who have seen their home values plummet are still committed to the idea that buying a home is a solid, long-term investment. Among those who say their home has lost a lot of its value, 80% agree that buying a home is the best long-term investment (36% strongly agree, 44% agree somewhat). 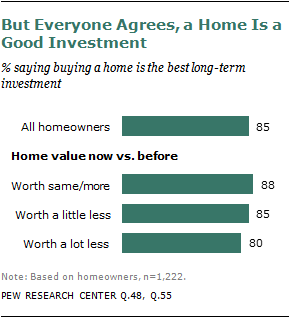 Homeowners whose home value has fallen only a little are equally enthusiastic about housing as a long-term investment: 85% say buying a home is the best long-term investment a person can make. Among those who say their home has maintained it value or increased in value, 88% agree.